The Lost Notebook Returns: "reader's high"
June came and went. July suddenly appeared out of nowhere, without notice, and I haven't the faintest idea how quickly time can pass. The weather has been beautiful despite it supposedly being the rainy season in Japan. I read three books. As soon as I finished reading "The Notebook", I started reading two books simultaneously. One is Haruki Murakami's new novel, "Colorless Tsukuru Tazaki and His Years of Pilgrimage" and the other is「怒らない禅の作法」—a book about zen. Then I moved on to a new book (essay) by Mariko Hayashi, which was too trashy to even mention the book title. Now I'm reading "The Great Gatsby" by F. Scott Fitzgerald. Why Gatsby? Two reasons. Because I saw the movie recently and was curious how the novel was written originally. Also, I found out that it happened to be Haruki Murakami's favorite book of all time. In an essay entitled "As Translator, as Novelist," Haruki Murakami notes, "When someone asks, 'Which three books have meant the most to you?' I can answer without having to think: THE GREAT GATSBY, Dostoevsky's THE BROTHERS KARAMAZOV, and Raymond Chandler's THE LONG GOODBYE. All three have been indispensable to me (both as a reader and as a writer); yet if I were forced to select only one, I would unhesitatingly choose GATSBY. Had it not been for Fitzgerald's novel, I would not be writing the kind of literature I am today (indeed, it is possible that I would not be writing at all, although that is neither here not there)." Anyway...why can I not stop reading lately? 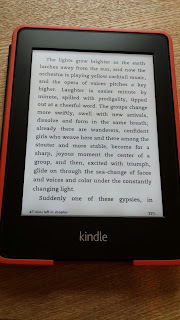 Am I experiencing the "reader's high"? Last fall, I experienced what seemed like the runner's high for the first time and this spring I had the writer's high after finishing up the master's thesis I'd written for 1 year. As a reader's high symptom, I feel restless unless I have new books waiting in the queue. I'm already chapter 3 of Gatsby and starting to feel anxious about the next book. I'm thinking of reading some old books by Murakami. There are still a surprising number of books by him that I haven't read yet, and his famous"Kafka on the Shore" may become my next victim.